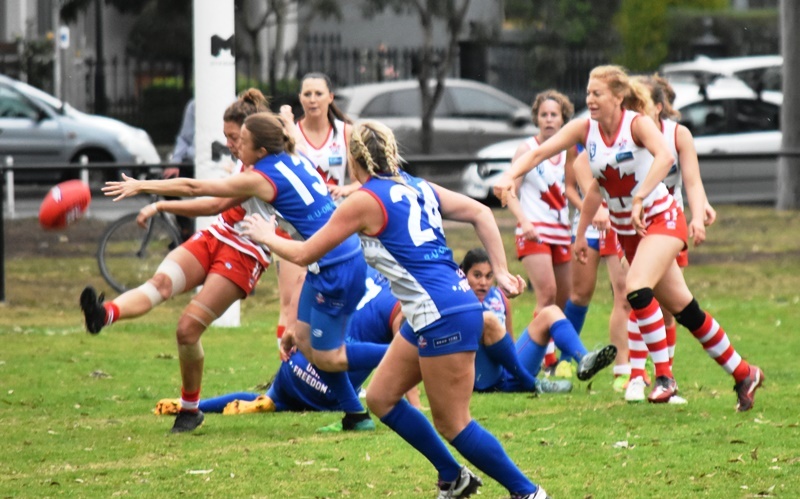 A breezy day greeted the sides at the McAlister Oval in Melbourne’s Royal Park this Tuesday as Canada’s Northern Lights were taking on the USA’s Freedom in the first semi-final on the women’s side of IC17. Canada bounced back after the narrow victory to blast Pakistan by 31 goals and then, to take down Great Britain by 31 points. In their first game, the Freedom came up against a tough opponent in Ireland. The US women won the second quarter, outscoring Ireland 8 points to 1, but the rest of the game was dominated by the Irish, who went out winners, 46 to 8. The Freedom also bounced back after their first game, beating Papua New Guinea and the European Crusaders. However, as we all know, in rivalry matches such as this, the records do not matter much. But what would matter is how these sides, that had both shown slow starts against quality opposition, would handle themselves at the beginning of the match. The first five minutes of the match were scrappy. Neither side was able to do much with the ball. Freedom ruck Brette Brower was winning most of the taps, but her teammates could not maintain the attack. 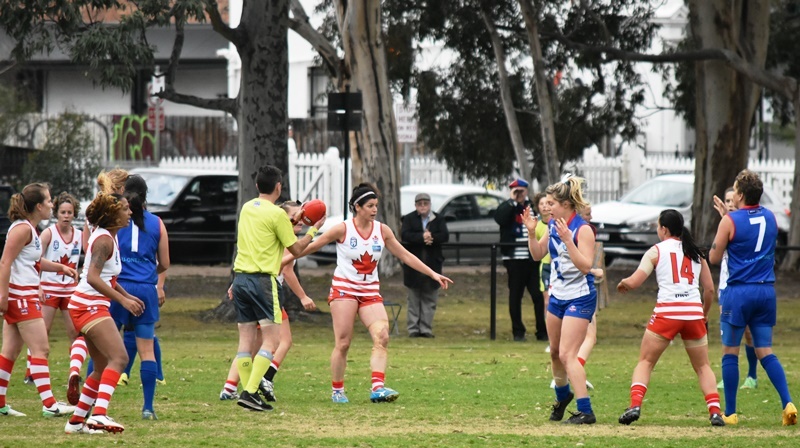 Just beyond the five-minute mark of the first quarter, with footy legend Robert DiPierdomenico cheering both sides on from the commentary box, Canadian Nicola Kirwan started the scoring with a long rolling kick that veered left and hit the goal post for a behind. For the next two minutes the US tried frantically to get the ball out of their own end, but could not. Northern Light Hilary Perry, who was seemingly everywhere on the ground, kicked the game’s opening goal. The Canadians looked to run away with the game as they pressed the attack again, but Aimee Legault’s kick was off line for another point. However, the Freedom, after the next kick out, were able to string some passes together and mount a serious attack. American Carly Smolak took possession of the ball on her forward arc, deftly shrugged off a defender and kicked the US’ first point. Now it was the USA’s turn to box the ball in to their forward half. With about 2 minutes to go, Denver Bulldog Hallie Kastanek took a strong mark 40m out from goal and followed it with a perfect set-shot straight through for a goal. So, it looked like the US would be down by just one point at quarter-time. However, after a long kick put the ball just outside the Canadians’ attacking 50, Canadian Alanna Robertson received a free kick for a push in the back. Her kick found Nicola Kirwan leading out to the left of the goal square.Rosemary Kloh was defending well, but could not make the spoil. Kirwan kicked true and at quarter time Canada was on top of the USA 2.2.14 to 1.1.7. The first break did not disrupt the Canadian’s renewed assault on the goals. 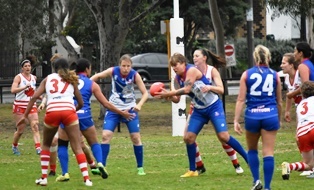 Inside the first minute, they put together a passage of play that saw a bouncing kick reach Nicola Kirwan alone in the goal square. She jogged forward and kicked her second goal of the game. The US managed to maintain possession of the ball for most of the middle of the second quarter, but they could only muster a single rushed behind. 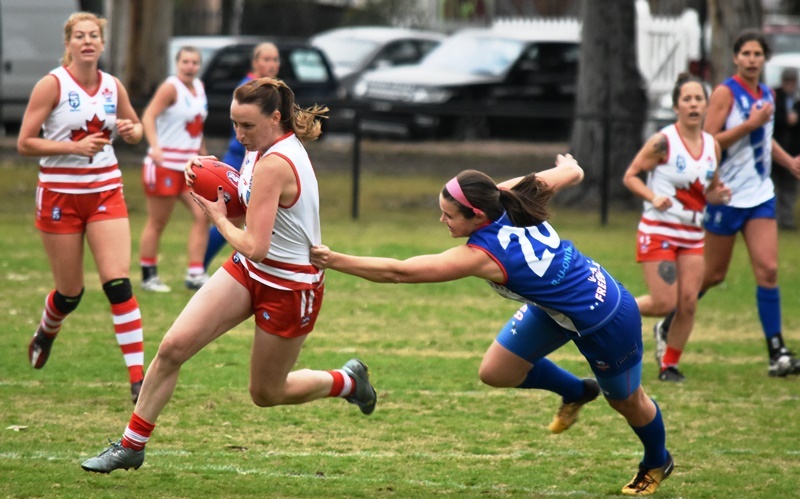 As the half drew to a close the Northern Lights put up two more goals – Aimee Legault managed to spit around in a tackle an get boot to ball in the goal square and Caroline Ireland hit a snap shot from the boundary about 30m around from goal just before the siren. Canada also added a couple of behinds to make the half-time score Canada 5.5.35 to USA 1.2.8. Canada added three more behinds in the third quarter to push the score to 5.8.38 to 1.2.8. However, the third quarter was most notable for two severe injuries. About 13 minutes into the third quarter, Canadian Kirsti Oja, who took Round 3’s Mark of the Day, leapt for a ball and came down wrong, but was then tangled up in a tackle and got the same leg caught under another player. She immediately grabbed her knee and was clutching at it as she was stretchered off. 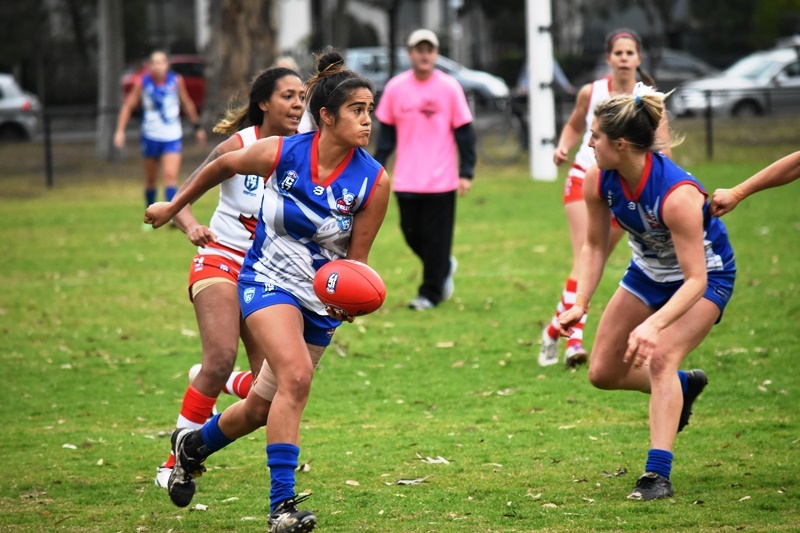 Then, with about one minute left in the quarter, Brette Brower, who had been starring for the US in the ruck, ran headlong for a ball and straight into an opponent’s legs. This hit appeared to jam her neck. She lay motionless on the ground after she went down. Paramedics rushed onto the field to attend to her and immobilize her. An ambulance was called and arrived about 35 minutes after the injury. Since the delay was so long, the game was called, which looked like giving the Canadians the hard-fought, yet somewhat hollow, victory. Or so we thought. Once the Ambulance had taken Brower to hospital, the game did actually restart. With the last quarter being just over 16 minutes (the same length as the third quarter before Brower’s injury). So it was Canada with the breeze in the last quarter with a 30-point lead. Canada added another goal through Nicola Kirwan to put any thoughts of a US recovery out of mind. The Americans battled hard into the breeze and threatened the goals for much of the quarter but the Canadian defense stood firm. There was a lot of kick to kick between the half back lines to no one’s benefit. In the end it was a 36 point win to Canada. Canada will take on Ireland in the IC17 Grand Final – a rematch of the IC14 Grand Final, and the USA will play Great Britain for 3rd place. Updates on injuries: For Canada it was Kirsti Oja with a knee injury and the USA’s Brette Brower was able to move her fingers and toes about an hour after the injury. About four hours after the injury Brower was still awake, able to move her extremities, and in good spirits. Thoughts, prayers, and well-wishes go to the both of them.